Citation: C N Trueman "The Battle of the Somme"
The Battle of the Somme started on July 1st 1916. It lasted until November 1916. For many people, the Battle of the Somme was the battle that symbolised the horrors of warfare in World War One; this one battle had a marked effect on overall casualty figures and seemed to epitomise the futility of trench warfare. For many years those who led the British campaign have received a lot of criticism for the way the Battle of the Somme was fought – especially Douglas Haig. This criticism was based on the appalling casualty figures suffered by the British and the French. By the end of the battle, the British Army had suffered 420,000 casualties including nearly 60,000 on the first day alone. The French lost 200,000 men and the Germans nearly 500,000. Ironically, going over the top at the Somme was the first taste of battle many of these men had, as many were part of “Kitchener’s Volunteer Army” persuaded to volunteer by posters showing Lord Kitchener himself summoning these men to arms to show their patriotism. Some soldiers were really still boys as young as 16, and the majority of men going to battle had no idea what warfare entailed. So why was the battle fought? Ironically, the head of the French Army, General Foch, believed that the attack in the Somme would achieve little – this view was shared by some leading British commanders such as General Henry Rawlinson. However, orders from the army’s political masters in London and Paris ensured that the battle would take place. Just how backward military thinking was then is shown by the fact that the British put a regiment of cavalry on standby when the attack started, in order to exploit the hole that would be created by a devastating infantry attack. British military faith was still being placed on cavalry attacks in 1916 when the nature of warfare in the previous two years would have clearly indicated that cavalry was no longer viable. This shows how conservative military thinking was during this war. Moreover the soldiers sent to fight on the battlefield were newly recruited volunteers and not trained military personnel. Conscription only began in Britain in 1916 but had been in place many years previously in France, meaning the French conscripts had usually some degree of military knowledge or training. British soldiers on the other hand were at a huge disadvantage and simply were not trained nor prepared for life on the battlefield. In fact, the Germans had deep dugouts for their men and all they had to do when the bombardment started was to move these men into the relative safety of the deep dugouts. When the bombardment stopped, the Germans would have known that this would have been the signal for an infantry advance. They moved from the safety of their dugouts and manned their machine guns to face the British and French. 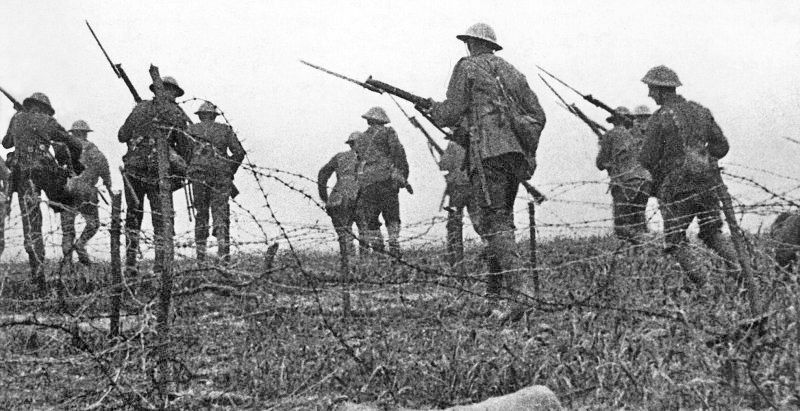 The British soldiers advanced across a 25-mile front. By the end of the battle, in November 1916, the British had lost 420,000, the French lost nearly 200,000 men and the Germans 500,000. The Allied forces had advanced along a thirty-mile strip that was seven miles deep at its maximum. Lord Kitchener was a supporter of the theory of attrition – that eventually you would grind down your enemy and they would have to yield. He saw the military success of the battle as all-important. However, it did have dire political and social consequences in Britain. Many spoke of the “lost generation”, finding it difficult to justify the near 88,000 Allied men lost for every one mile gained in the advance. However, during the battle media information on the Somme was less than accurate. This was written by John Irvine of the “Daily Express” on July 3rd 1916 – though his report would have been scutinised by the British military and government and he could only have used what information the military gave him. —George Coppard, machine gunner at the Battle of the Somme. In the course of the battle, 51 Victoria Crosses were won by British soldiers. 31 were won by NCO’s and 20 by officers. Of these 51 medals, 17 were awarded posthumously – 10 to NCO’s and 7 to officers. “The Battle of the Somme”. HistoryLearningSite.co.uk. 2014. Web.